As moving day draws closer, my studio gets a little emptier. I’m officially past the point where I could make any work. My wheels, tools and (most importantly) clay are all packed onto our first Pod. It feels very strange to be without a studio to work in. It’s been a long time since I’ve been without. The house renovations and getting ready for our move to Minneapolis is keeping me plenty busy, but I’m seriously missing making pots. I’m excited about starting fresh with a whole new body of work from my new studio and (future) new kiln. So I’m selling off most of my inventory. I’m having one last (last minute) Moving Sale this Friday, June 5th from 4pm – 7pm. Everything is at least 50% off. Much of it is marked down even further. I’m finding new gems as I clear off my shelves during the packing process. If you’re in Chicago, swing by on Friday after work and say hello and maybe pick up a pot or two. One for yourself and one for that wedding you’re going to this summer! One Day Sale! 20% off Everything! Last minute holiday shopping? Have you been thinking about getting a new mug for yourself? Do you need another serving bowl for Christmas dinner? Your procrastination has paid off. I’m having a 1 day sale this Saturday, December 20 from 10am – 6pm in my studio in Chicago. 20% off everything (and that even includes the pieces that are already marked down). There are even new pieces that I will be putting out on Saturday. I think you’ll find a little something for everyone. There are mugs, tumblers, bowls in all sorts of shapes and sizes. Necklaces, soap dispensers and honey pots fill the shelves. I even have these great new spoon/ teabag holders that are the perfect stocking stuffer for that tea lover in your life. You can’t put off your holiday shopping much longer! 20% off everything, including pieces that have already been marked down! There is plenty of street parking which is not an easy thing on Chicago’s snow covered streets. You can also find your way there with many public transportation options- like taking the Brown Line to the Montrose stop. There are tons of other studios to shop in, as well as the gallery at Lillstreet. And Montrose has a bunch of little shops and restaurants. My favorite little gift shop, Hazel, is just down the street. You can make a day of it and get all your last minute shopping done by shopping local! I’ve been locked away in my studio this fall filling it with pots for the holiday show at my studio. Mugs, necklaces and bowls are stacked on the shelves. Lots of smaller pieces that will make perfect gifts. 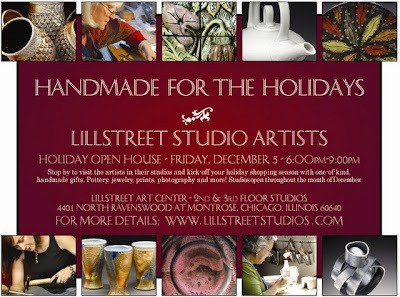 This Friday, December 5, 2008, is the opening celebration at Lillstreet Studios in Chicago from 6pm – 9pm. You can find me in my studio on the 2nd floor on Friday and throughout the month of December. There are over 50 artists at Lillstreet making pots, tiles, jewelry and more. It’s a unique place where you can shop directly from the artist’s studios as well as from the Gallery at Lillstreet. The opening of the show is on Friday from 6pm – 9pm, but the studios will be open throughout the month. There is plenty of parking and accessible by lots of public transportation (Montrose-Brown Line, Lawrence-Metra, Ravenswood-Montrose Bus, etc…). I’ll be posting a preview of my newest work over the next couple of days so watch out for the updates! 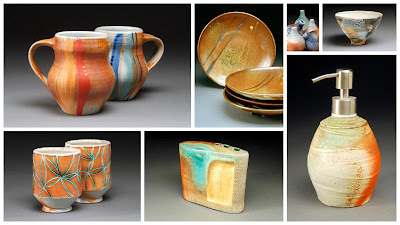 Crazy Pottery Sale – this Friday and Saturday! I’m making space for new work in my studio and having a HUGE sale this Friday and Saturday in my studio. I’ll be selling sample pots, pieces from the back of the shelves, discontinued forms and more for big discounts. Seriously, this is the first time that I’ve marked work down this much. (There are tons of pieces that will be $5 – $10.) It’s time to the shelves for new work. Help me make room! Have you been wanting to pick up a couple of plates for yourself? Do you have a wedding to go to this summer and need a gift? Have you gotten your dad a Father’s Day present yet? Stop by and take advantage of this big studio sale! I hope to see you this weekend!